The first Monday morning after Zach Harwick’s homeschool basketball season ended, the high school freshman was at the YMCA at 5:30 in Edmond, getting in his shots. 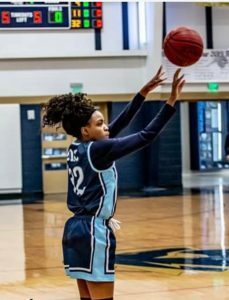 Junior Jaynae Eddens played in a tournament game on her AAU (Amateur Athletics Association) team last Saturday, a day after playing in her homeschool team’s national weeklong tournament in Missouri. Zach Harwick, Grant Shelton and Jaedon Eddens. These players represent a growing number of students in and around Luther who are home educating and pursuing athletics, in this case basketball. 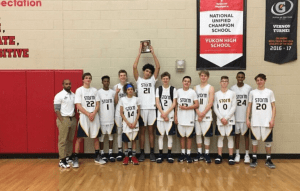 Eight Luther area students were on OKC Storm basketball or OKC Knights teams and concluded highly competitive seasons at the National Christian Homeschool Basketball Association Tournament in Springfield, March 11 – 19, 2019. The tournament draws 350 teams from as far away as California to the west and Michigan to the north for a full week of games in a chase for gold balls and championships. 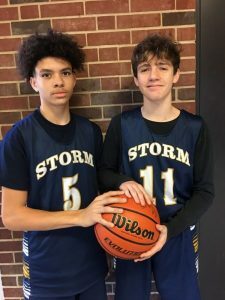 It was the first year tournament for Luther’s Dalton Burt and Marcus Jones who played on the Storm 14U North team and got in a couple of wins at the tournament and great individual play. Both students are enrolled in Epic Charter Schools and plan to keep playing. “There are lots of good things about Luther. Located so close to Oklahoma City, it’s easy for the small communities with good athletes to participate at a high level. 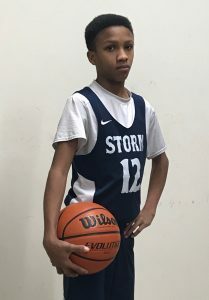 Also with multiple kids from several age groups, Storm can meet those needs of families,” said Kurt Talbott, OKC Storm Athletic Director and coach. In addition to basketball, the Storm offers track, golf, tennis, cross-country, volleyball and will add dance and pom this summer. Luther students also participate in other sports such as football with the Patriots or baseball with the Broncos. “Despite its inherent difficulties, we have thoroughly enjoyed the homeschooling experience. Homeschool sports in particular is a unique lifestyle that facilitates an intimate parent/child experience and enjoyment of sport activities. 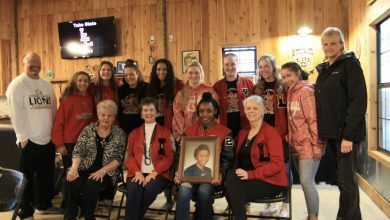 We absolutely love it!,” said Pat Eddens who is also a longtime coach on Little League sports in Luther. Their OKC Storm players are Lael, Jaedon and Jaynae. Pat and Hellen are also the parents of Raelene Eddens, who plays for Oral Roberts University, signed after her OKC Storm basketball career last school year. Watching the Eddens family and other families switch to home educating gave another Luther family the confidence to make the switch a few years ago. The switch from public school was at first hard for the Harwick family but they have not looked back. “We still have pride in our town and are Lions at heart when we cheer,” said Jamie Harwick, a Storm Superfan, who runs a successful screen printing company with her husband at Glassic Designs. She said as a small business owner, home educating has allowed her family the flexibility for her to work, her sons to pursue their passions while getting a quality education. 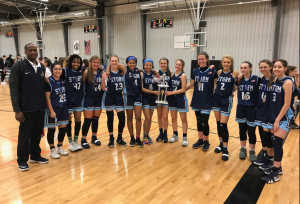 Jaynae Eddens on the OKC Storm Girls Varsity team won their regional tournament in Wichita. 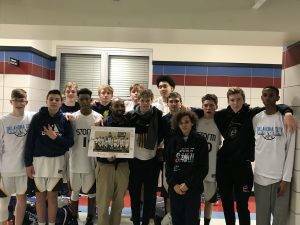 The OKC Storm 16U team with Harwick and J Eddens won the Yukon tournament earlier this season. The Harwick’s also joined Epic Charter Schools this year. Other families in Luther do their home educating themselves using a variety of resources, or participate in local co-ops who gather for courses in math, history, science, art and other activities. There are even resources available from the Oklahoma State Department of Education. Coach Talbott said he was overall pleased with the teams this basketball season. “Many memories were made and our program spirit was seen all week at the games we played. Our 12u and 14u girls were Undisputed National Champions, our 16u girls and 18u boys finished 2nd overall and our 14u boys made the Final 4. As the Storm players found their way to a court on Monday to get in their shots and workouts, they also got back to the books. The parents caught up on laundry, spring cleaning, lesson planning and maybe a nap because summer basketball is just around the corner. 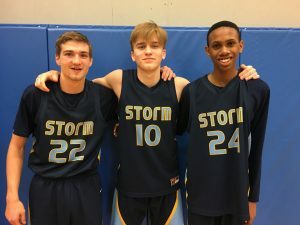 Harwick and Eddens on OKC Storm.